Description: The Judge Public Defender by Taurus delivers the same devastating power as the Judge in a scaled-down size that's easy to carry. 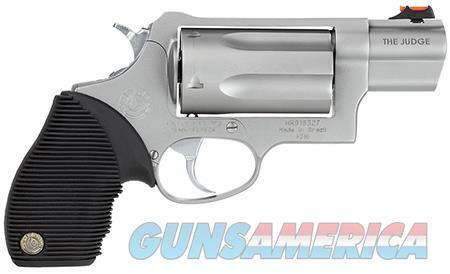 The Public Defender features a reduced profile hammer, an extended ejector rod, a ribber grip, the Taurus Security System, a transfer bar, and a red fiber optic fixed front sight. Thios model has a matte stainless (silver) finish.